Twenty years after he emerged in our lives as a practising politician, Manmohan Singh appears to be happily dismantling the very attributes that endeared him to the chattering classes—or allowing those around him to do so. For one, as the 2G and CWG scams show, “Mr Clean” has wilfully turned his nose away from the stench of corruption asphyxiating his government, while blithely letting the attack dogs in his ministers to tear into independent institutions like the election commission and comptroller and auditor-general—and the media. There is dark talk of the return of “estate tax” that is widely believed to have paved the way for the reforms that he unleashed in 1991, in this year’s budget. And now the original reformer who opened the nation’s doors to the world and taught us to trust “the other”, is talking of a “foreign hand” behind the protests at the Kudankulam nuclear power project. The irony is too heavy to be lost: a government that is seen to have surrendered to the “foreign hand” behind the Indo-US civilian nuclear deal, a government that is seen to be the chihuahua of global finance giants, is turning against a citizenry fearful of what reactors can do to their lives and livelihood, post Fukushima. Behind all this is the dire message: Agree with me, agree with what we do. In the Indian Express, the commentator Pratap Bhanu Mehta writes that the prime minister’s remarks show a diminishing space for dissent in our democracy. “On the surface, Indian democracy has a cacophony of voices. But if you scratch the surface, dissent in India labours under an immense maze of threats and interdictions. What is disturbing about the prime minister’s remark is its construction of what dissent is about. “The idea that anyone who disagrees with my views must be the carrier of someone else’s subversive agenda is, in some ways, deeply anti-democratic. It does away with the possibility of genuinely good faith disagreement. It denies equal respect to citizens because it absolves you from taking their ideas seriously. “Once we have impugned the source, we don’t have to pay attention to the content of the claims. The necessity of democratic politics arises precisely because there is deep, good faith disagreement. Reducing disagreement to bad faith betrays a subconscious wish of doing away with democratic politics. “This has serious consequences for dissent. Our actions and rhetoric are sounding increasingly like China’s. The state, when challenged, will often resort to all power at its disposal to pressure organisations and institutions. Make no mistake about it: seriously taking on the state is still an act of bravery in India…. “The prime minister unwittingly showed what a banana republic India can be. If a few crores here and there, given to NGOs which have no instruments of power other than their ability to mobilise, can bring this country to a standstill, then we are indeed in deep trouble. Is India moving towards becoming a dictatorship? This entry was posted in Issues and Ideas and tagged 2G Scam, Centre for Policy Research, China, Churumuri, CWG Scam, Fukushima, Keshav, Manmohan Singh, Mr Clean, Original Reformer, Pratap Bhanu Mehta, Sans Serif, The Hindu. Bookmark the permalink. ← CHURUMURI POLL: All over for Yediyurappa? There has not been much change in MMS, as portrayed. The reason India could take a diversion from its stagnant Nehruvian rate of growth was because of a strong leader called PV Narasimha Rao. The decisions he took needed backbone, which MMS dosent have (sorry for being blunt). And its well understood that this is not MMS’s govt. he is just the rubber stamp. The Nehru-Gandhi family has always considered India as a worthless place which needs to be carried by some great leaders, they have never allowed India to stand on its own feet. So the signs of undoing 20 years of liberalization is not at all surprising. Their main aim is and always has been to have the reins of country’s administration in their hands, and not make India self-sufficient. Be it NREGA or FSB or CVB or FDI etc … every action reeks of this dictatorial attitude. and the worst thing is that the congress knows this and couldn’t care less …it has faith in coming back to power using doles like NREGA etc etc to keep people hungry and dependant . Dr.Manmohan Singh is an academician. He is not a leader or a politician to take good decisions Added to these he is a retired bureaucrat who had spent long years under the rules and commands of the ministries. Naturally he is a xenophobe and cannot not take chances, instead he would be good in writing economic thesis and reasons for the failures. The position that he got is gifted to him by chance because of the inability of the leader to face a parliament. What a stupid whine article. Yeah, in some ways, it is about time we start “sounding like China”. An assorted cabal of intellectuals, bleeding hearts and leftist idiots do their best to display some useless “activism”. You fool (addressing the writer of this article), the “country has not been brought to a standstill”, as you put it. A nuclear power project in one Indian state has “come to a standstill”. And your free usage of heavy sounding words like “banana republic” clearly shows your pseudo-intellectualism. These bloody pseudo-intellectuals look at the West and see some post-modern protests against things like dams and nuclear power there, and try to ape those protests here. Who can afford such protests? Rich nations like Scandinavian nations, etc. These nations raped the environment and made progress when they had to. Can India really afford this pseudo-intellectual activism? Everyone wants the government to play fair, but the goddamn activists don’t want to play fair. They trawl the masses of Europe and the US begging money for “poverty eradication” in “poor India hungry India”, and then come here and spend the money on pseudo-intellectual activism. Serves them right if they are banned. I extend my full support to UdayaKumar even if german funded. In Delhi bomb blast case Iran and Israel fought. If Hitler performed holocaust its also true churchill dropped bomb on japan and both were genocides. and the guy who slapped Pawar being roughed up ‘unknown goons’ now havent we seen enough Indian movies who these unknown goons are…..
His policies are similar to that of a bully, who lets his team do the damage and later say its not done on his orders and escape. Did anybody observe that the kundankulam fiasco is actively supported by the Church. Why is the church taking an active role in this. Could it be because the russians are helping us in kundankulam, the brits and americans got shafted, while the french are getting orders for new nuclear plants. There is something very fishy about this whole protest going on. “Reformer” Manmohan singh?? 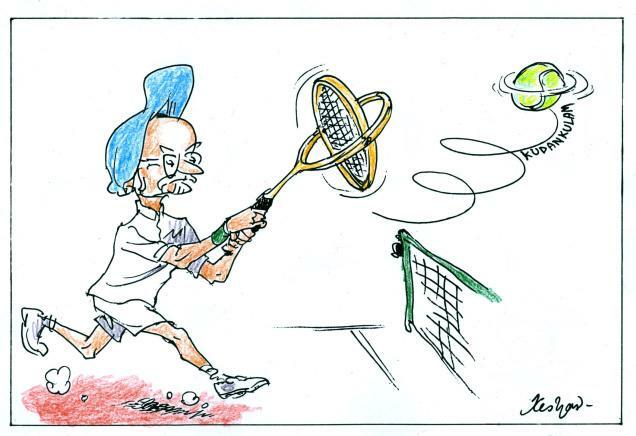 I believe MMS is a great bureaucrat, who carries out orders. Under PV Narasimha Rao, he was told to liberalize, he did. Under Sonia, he was asked to become a socialist and he did! If the credit for Reform should go to anyone, it is to PVN – not MMS. harkol, PVN is credited with reforms and he was voted out. Huge scams take place and ……..
And we talk of democracy, people’s power etc.! >> dark talk of the return of “estate tax”.. If MMS can pull this off, my vote (again) goes to MMS. We need the Estate Tax / Inheritance Tax to kill the crony capitalism that exists in India. MMS and Monek Singh are hand maidens of World Bank and IMF…make no mistakes about it. Given an option he would be doing what IMF and World bank dictated him to do. But PVN was too clever to continue this charade and took timely decisions to liberalize the economy. Read the book “Bad Samaritans” for more information. India decided to liberalize because BANKRUPTCY was not an option for INDIA (but Kingfisher has an option). Let us not argue about who deserves the credit. PVN/MMS did what they were forced to do and needed to do at the time. We are fortunate to have MMS as PM. Time Mirji resigns. Down with lawyers. In our country a PM who is directly elected by the people and has a mass base however small is more likely to feel the need to be accountable to people, rather than someone who has been appointed by his party due to lack of other alternatives. Such a person is more likely to be partial to the person or party that appointed him. It is true that in many cases this government has tried to ignore parliament and refused to consider dissenting views. In a democracy the government is expected to listen to dissent, appropriately counter that and explain why a particular decision makes sense. However, in this case it has been widely reported that the protesters have been getting support from NGOs. The PM was merely making this point and in the past did send delegations to meet the protesters. It is hard to agree with the commentator that this instance is an example of intolerance. Looks like u don’t read anything except your own blog. Dont try to spin this. The environment mafia hates India and hates the world and in particular, wants to keep the third world poor and illiterate so it can market its lies. These are non-state actors just like terrorists who carried out the 26/11 attacks. No reasonable country on earth sponsors them. So, when MMS talks of outsiders in Kudankulam, he is quite credible. Jihadi terrorists and environment mafia arent made up, they are very real.